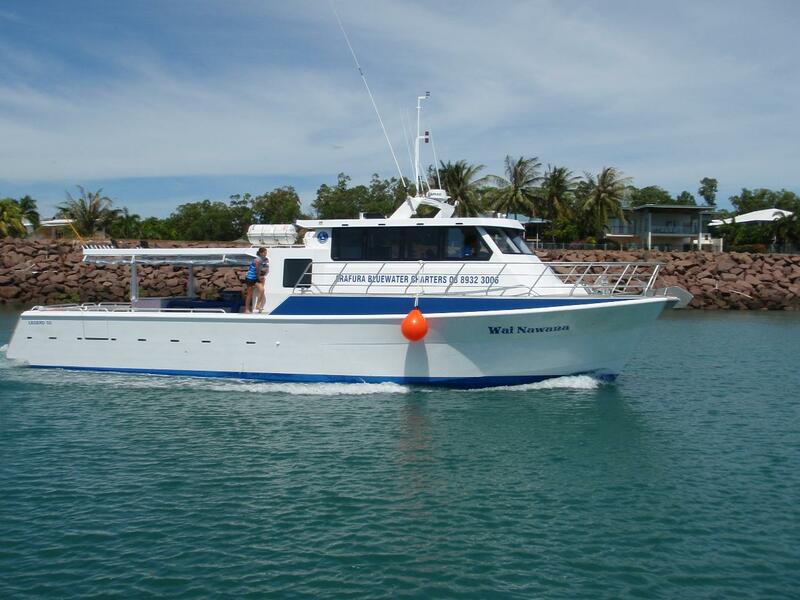 Fishing Aboard our Vessel: Wai Nawana. air-conditioned bunk accommodation and excellent crew. medications required. BYO alcohol (no glass please). Meals: Your friendly crew will cook for you each day, a scrumptious breakfast, lunch & dinner. Please note: The menu may change without notice. These charters open up a huge area of remote territory fishing depending on weather, the time of year and tidal movement. The Tiwi Islands and outer shoals some 70 nautical miles from Darwin is one option for the neaps (Small tidal movement) and is home to huge Gold Band Snapper, Red Emperor, Tricky Snapper, giant Trevally, Spanish Mackerel, with a stop at Cape Fourcroy for a session on the areas large Golden Snapper and powerful black Jewfish on the way home.